Tallahassee, FL – A long-time law officer with the Wakulla County Sheriff's Office has announced he's running to be the next Wakulla County Sheriff. As Sascha Cordner reports, Monday's bid comes after the current Sheriff's resignation earlier this month, after serving the county for more than three decades. "My name is Maurice Langston and I want to be your Wakulla County Sheriff in 2012." "Perhaps I've been there when you got married or some of your family got married, perhaps I've been there when you've lost a loved one through a process, possibly at the hospital, maybe I was there at the birth of one of your children, maybe at their baptism, and I say that to say this, the key component to that is that we've been here and we've been here together." Supporter James Shelton is a resident who's lived in Wakulla County for more than 20 years. He's known Langston for about 15. Shelton says he has every confidence in Langston as a "tough but fair" Sheriff. He gave an example of how Langston has helped him in the past. "He helped me runaway some crackheads in my neighborhood and I thought that was really good because that's the downfall of America. You know?" Another strong supporter has known Langston his whole life: his son, Cahill Langston. Like his father, he too works for the Sheriff's office. He's the Chief Technology Officer. The younger Langston stood with his wife and two kids, alongside his father as Major Langston made his bid for Sheriff. He says his father talked it over with his family before moving forward. "He called us all and said that hey, that's what's going to happen and this is what we're looking to do. What do you think? And, what do you say about that? You know the Lord told you to run and I'm telling you no. No, of course, not obviously! We're 100-percent behind him, 100-percent." Though Cahill received some strong support, others are unsure. A spokesman for the Wakulla County Sheriff's Office says the department is not endorsing any candidates at this point, but that does not mean it won't in the future. That also goes for Wakulla County Republican Executive Committee Chairman, Ed Brimner, who was not at the conference. 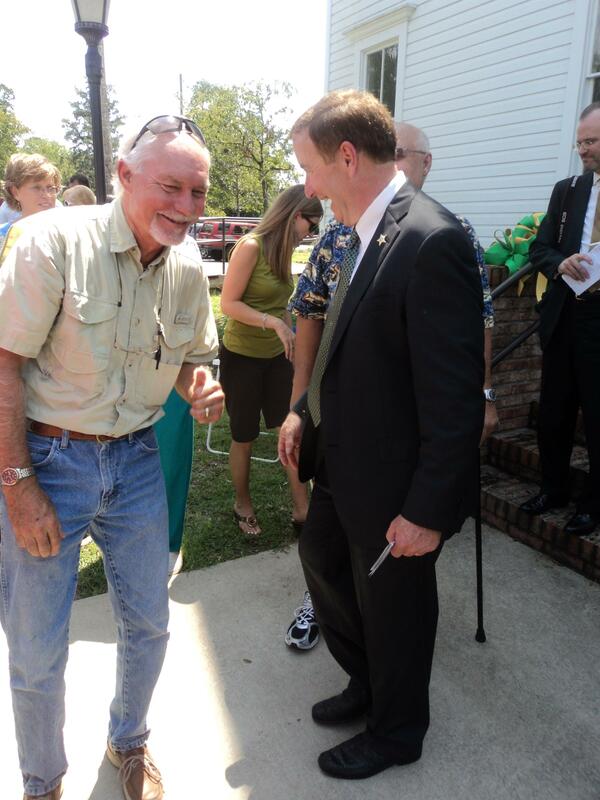 As a former Wakulla County Commissioner, Brimner worked closely with current Sheriff David Harvey. He says whoever wins has big shoes to fill. "Sheriff Harvey has spent close to 35 years building a reputation in the state of Florida. I don't care who's elected that they are going to be to replace David Harvey. They will certainly try to emulate David Harvey, a lot, if they're smart, they will. But, they will not replace him." Major Langston says what he is trying to do is be a non-political Sheriff like his ancestor Sheriff Willie Langston. He adds he's looking to continue making house calls, stay on the cutting edge of technology and provide residents with the best law enforcement at the lowest possible cost. Langston is running against a former state trooper for 30 years, Charlie Creel. Creel's retired now, but he ran for the Sheriff's position against current Sheriff David Harvey in 2008. Creel lost the election by a thin margin, but he announced his plans to run again in May. Currently, Governor Rick Scott has not yet announced his pick for interim sheriff, for when Harvey officially leaves in October. Creel says he does not want to be considered for that position, because he wants to become the sheriff when residents decide in the 2012 election.